Time for a well deserved chance to smell the roses! 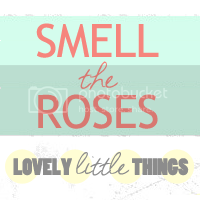 to see what others have done this week to smell the roses! This weeks task was to redecorate something in your home and I thought I would share the redecorating of our patio. My husband actually did this little redo of our patio landscaping! There are no before pictures because we really wanted to rid our patio of dead plants. So here's the outcome! I love coming home everyday to pretty looking flowers and lots of green on the patio! It also makes it feel so homey! The the hubs: I know I complained a bit when you wanted to stop at home depot, but thanks for a great redo! Look how pretty it looks! Ok so in addition to my stop to smell the roses, I wanted share the mug I got from the mug swap that I mentioned a couple weeks ago! Thanks so much to Jenn from Sunnier Side of Sass for the cute matching travel mug and teapot! So cute! Can't wait to make tea! Go here to see more mugs! I'm a 33 year old wife, sister, daughter, teacher, Christian, crafter, and much, much more! This blog is my place to share about my life, teaching, and all that life brings! Hope you enjoy! Now that you're here, be sure to let me know you stopped by! Leave a comment! DIY: A little Blog Planner goes a long way! It's the Age of Aquarius!